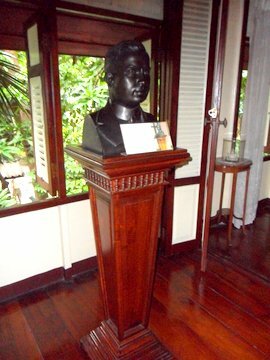 The Bangkok Folk Museum was originally the home of the Suravadi family. Built in 1937, it’s tucked away in Soi Charoen Krung 43, off the famous Charoen Krung Road, the oldest road in Bangkok, built in 1860 during the reign of King Rama IV. 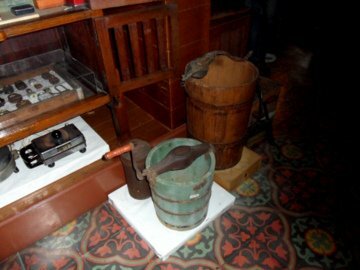 The family home was converted to this museum to preserve the lifestyle of early Bangkok and also to record the history of Bangkok and the Bangrak district, where the museum is located. 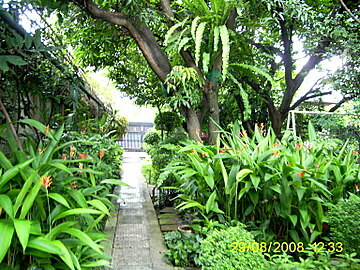 On 1 October 2004, the property was donated to the Bangkok Metropolitan Authority who now manages the place. 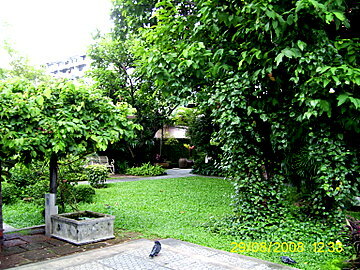 There are four buildings set in a lush garden in half an acre of land in the busy commercial Bangrak district near the Chao Phraya River. Three of these building are open for public viewing. Acharn Waraporn Surawadi, daughter of the original owners, lives in the fourth and it was through her dedicated efforts that the Bangkok Folk Museum was established. The first building, which used to be the family home, is a two storey wooden building with a covered verandah at the back. The ground floor consists of an anteroom connecting to the dining room, guest room and library. There’s an air of nostalgia in the house where there’s a grandfather clock and an old gramophone that has to be started by a lever. 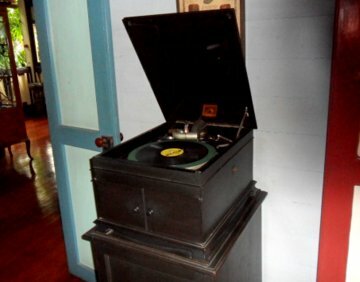 On my first visit in 2004, an old 75-rpm record of “Would I Love You” by Doris Day and Harry James was still on the turntable. The record has been changed when I revisited the museum in August 2008. 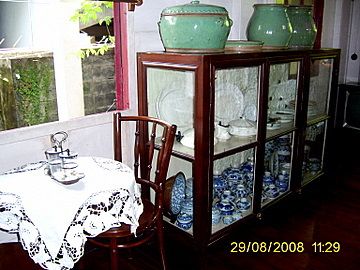 The dining room has a collection of European porcelain around the 1899 – 1913 period and old Chinese ceramics. 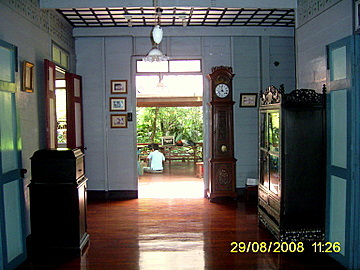 The rooms in the Bangkok Folk Museum have been meticulously preserved. Looking at the vintage displays in the house, one gets the feeling that time has stood still. On the way upstairs, I noticed this contraption on the landing. You’ll never guess what it’s for. 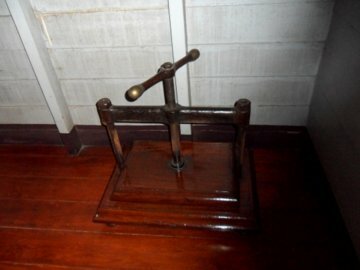 It’s the old method for pressing clothes, especially sarong wraps, drapes for long dresses! 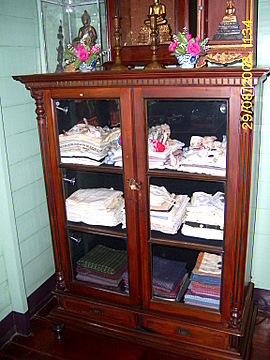 The clothes are placed between the two boards which are then tightened. You’ll have to wait three days though! Upstairs there’s another model. 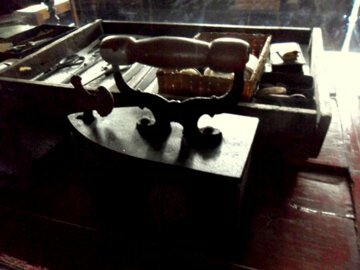 These devices were use as the charcoal irons in those days don't have heat regulators like our present electric irons. Delicate fabrics like silk can be ruined by the heat. The four rooms upstairs have a comfortable and well lived in air about them. 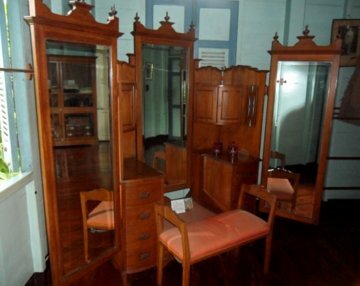 The first was the ancestors’ room where relics of family members are kept. 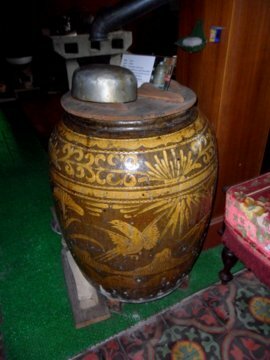 The old Benjarong jar, the Thai porcelain in five basic colors, was from the days of King Rama V (1858 – 1910). 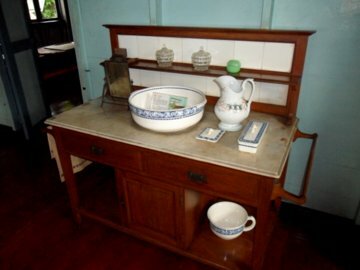 Some of the other porcelain pieces in the Bangkok Folk Museum are from the early Rattanakosin era. 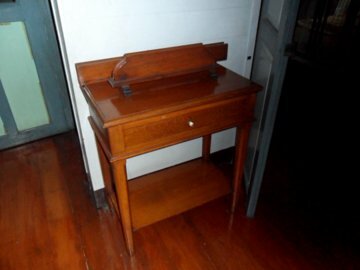 and an old sewing machine. The second building in the Bangkok Folk Museum is a two-storey house to the rear. This was meant to be the home and clinic of Dr Francis Christian, Acharn Waraporn’s stepfather. The house was first constructed in Soi Ngamduplee, off Rama IV Road in 1929. The space downstairs was meant to be a clinic with the living quarters upstairs. However, Dr Christian died before he could move in and the house was rented out. 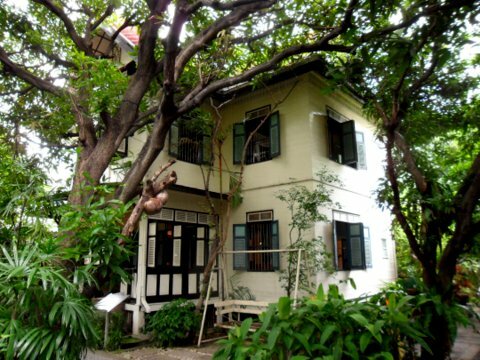 When Acharn Waraporn decided to convert the premises in Soi Charoen Krung 43 to the Bangkok Folk Museum, the house in Soi Ngamduplee was dismantled and transferred to Charoen Krung. The building has been preserved in memory of Dr Christian. 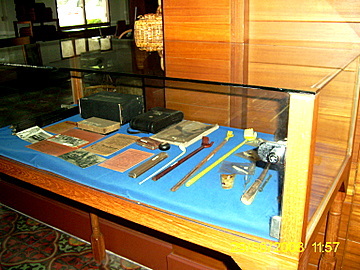 A room upstairs displays medical equipment used in the early 1930s. 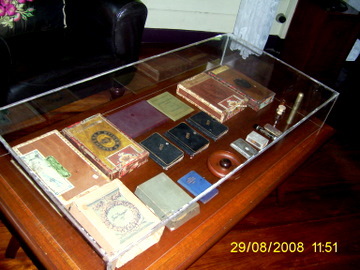 Dr Christian’s fondness for cigars is evident from the old cigar boxes on display in his bedroom which has a four poster bed. 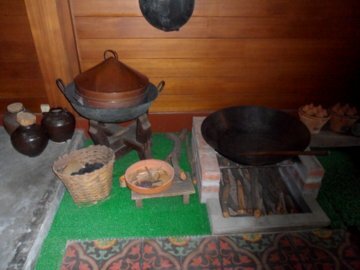 The third building in the folk museum has a collection of traditional kitchen and household utensils on display on the ground floor. A walk through the wide hall on the ground floor is like walking through a time warp. 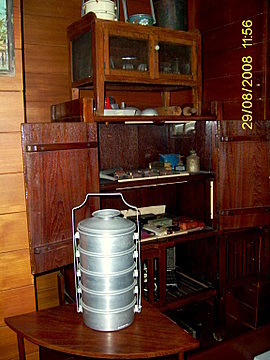 In the old days, tiffin carriers or lunch boxes were used to keep or deliver food. Before the days of refrigerators, food was stored overnight in meat safes. The “wok” is the traditional frying pan using in many South-east Asian countries. It’s still in use today. So are the food steamers. They are multi-tiered today. 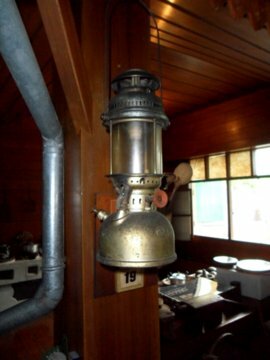 These were the kitchen stoves in the first half of the 20th century before gas and electricity were available. 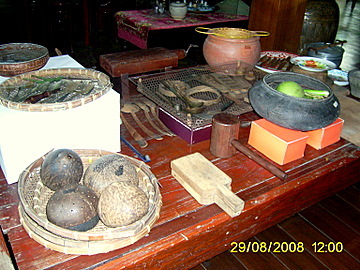 The perforated coconut shells of various sizes on the left are actually cooking timers. They are placed in bowls of water. The timing is based on how long they take to be completely immersed. Do you remember the wooden back scratchers? 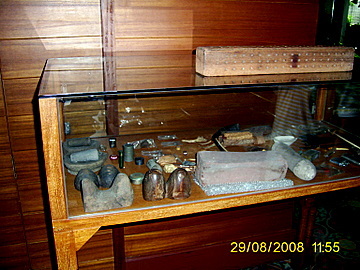 The egged shaped stones to the left of the showcase are for massaging the back. Care for an old fashioned massage? During this visit I replaced some of the photos I took earlier and also took additional shots of items I missed in my previous visits. Some of these household items are nostalgic. Can you remember any of them? The upper floor of the third building houses the Bangrak Museum a community museum set up by the Bangkok Metropolitan Authority to preserve the history of Bangkok and Bangrak district. The Bangrak Museum is covered separately in Bangkok Museums. 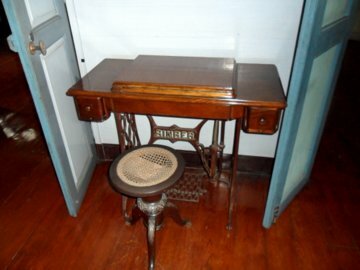 The Bangkok Folk Museum is a depository of relics and a way of life in a bygone era. As a historical record of the lifestyle in the early 1900s in old Bangkok, it’s invaluable and truly a Bangkok legacy preserved for posterity. 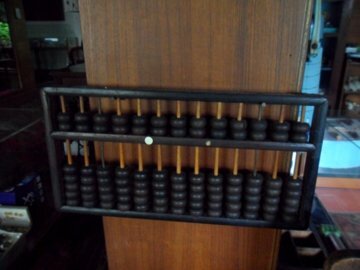 We are grateful to Ms Waraporn Surawadee for preserving her home for posterity. It’s an undertaking done out of love for her heritage, the heritage of her family and her community. On my most recent visit on 28 July 2013, I had the chance to meet Acharn Woraporn, the lady who donated these buildings for the museum. It was my pleasure to be able to have this photo taken with her. We are grateful that she has donated three buildings of her old family home to preserve a segment of old Bangkok history and Bangrak district’s cultural heritage. My thanks must also go to the volunteer guides at the Bangkok Folk Museum for their helpfulness and hospitality in hosting me during my three visits. The museum has also a full-time guide now. All photographs on this page are with the courtesy of the Bangkok Folk Museum. Assoc Prof Waraporn Suravadi passed away peacefully on 25 January 2017. Acharn Waraporn met with a most unfortunate accident at home when she fell while trying to help her pet cat off the roof. She was kept on a respirator in hospital but failed recover from her injuries. 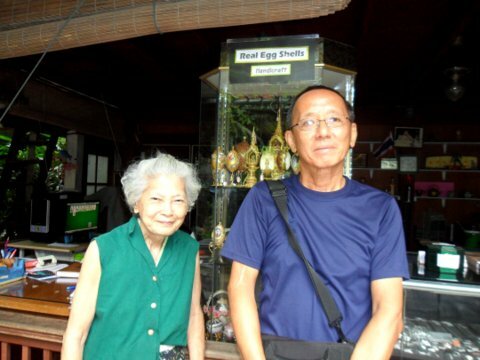 Acharn Waraporn will always be remembered as the founder of the Bangkok Folk Museum which she established by donating her family home to serve as a house museum to preserve the old way of life in the late 19th and early 20th C.
May she Rest in Peace and may her legacy of the Bangkok Folk Museum continue in her memory. If you're coming by skytrain, get off at the S6 Taksin Bridge station and walk along Charoen Krung Road. Soi Charoen Krung 43 is on the right after the General Post Office. It’s a little over a km. Once you are in Soi Charon Krung 43, keep walking till you pass under the flyover. The Bangkok Folk Museum is just a little further on the right. 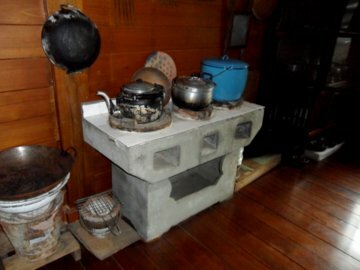 The Bangkok Folk Museum is open every day between 10:00 am – 04:00 pm except Mondays and Tuesdays. The main gate to the home is usually closed. Ring on the door bell and a staff member will let you in.